The celebratory autumnal visage is for me one of the plentiful harvest and halcyon days before the dark storms of winter. Enticing and comforting chunky woolen knits and earthen hued layers, with the occasional pop of colour, are my usual fantasies for the season. And yet, hidden within the deep recesses of my mind, cloaked in shadows, there is always a more somber and brooding aesthetic that calls out to be expressed in light of the grey skies and melancholic tune of rain drops against the pavement. On certain days you wish to conjure up a swell of black smoke to surround you, to comfort you from the rain. It is not out of anger or sadness, but for the wonder one feels when watching the wisps of smoke rise and swirl from the dancing flame of a candle. There is a mysterious quality to the concept, and a sense of the unknown, which teases as much as it reveals. Indeed the concept is one which can be taken as far as the wearer chooses and is comfortable in, and yet regardless of what that furthest point may be, it is the idea of expression, rather than simply the expression itself which holds such great meaning. I suppose I find the concept so appealing because it is so wonderfully elusive for me to pinpoint. I tend to struggle to create those dark and yet oddly romantic looks, often retreating to the safety of the joys of subtle colour play. However, I must admit that in with the upcoming wintry months, I find myself visualizing potential concepts and ideas which my mind and heart quite honestly yearn to be expressed. The accessibility of such concepts can at times be rather hard to grasp at, for the creations from the likes of Rick Owens and Gareth Pugh are not for the faint of heart. And yet, I find there to be such a beautiful appeal, that I feel if I could in some way express that I would be happy. That is not to say that I wish to replace my wardrobe with swathes of sheer black jerseys, metallics and washed leathers, but rather there is a concept that I have yet to have the joy of exploring and learning about at a personal level. I think that accessibility to a new concept is easily attained through the most subtle of changes. Indeed the channeling of a trend or idea can most often be done simply through a choice of accessories. As such, I feel that reworking the clothing and accessories I do have could quickly yield the initial fruition of such a concept. 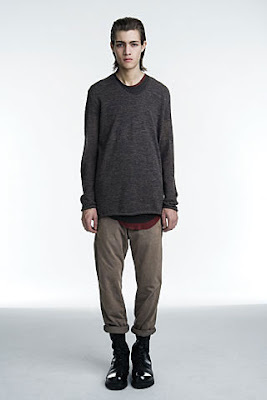 Wearing a slouchy grey jersey top, with skinny black jeans and black military boots, quickly becomes a new aesthetic pathway. Of course to adapt it to one's own style, perhaps not devoting to the concept in its entirety for risk of losing identity, is the perhaps the favoured path of choice. 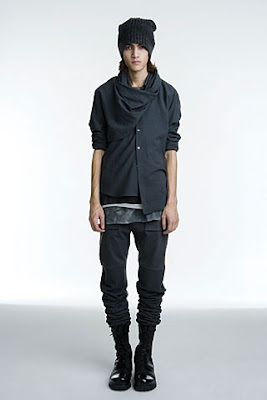 The Fall '09 collection for Helmut Lang was one which I feel illustrates my point in that it was most certainly dark and enticing, and yet there was a certain accessibility and universality to the looks. The simple layering of t-shirts and tops was indeed functional and yet created a distinct style to the looks that conjured images of traveling through the nightly storms. Washed, burnished, frayed and worn-in, the looks had character and a definite sense of story. Whilst the concept of the collection and the looks themselves were not entirely new in their finish, it is the ease of the collection which I admire. The display is simple and achievable, and that really does serve as the best of introductions. Beautifully written passage and lovely looks, DK. Especially digging that pale heather gray sweater! Autumn is coming! Autumn is coming! I am bubbling over with excitement at the mere thought of the changing of seasons. That bright crispness in the air that comes out of nowhere, but is always welcomed. I am trying to put more color into my wardrobe this season in unexpected ways, but my black and gray will still be front and center. 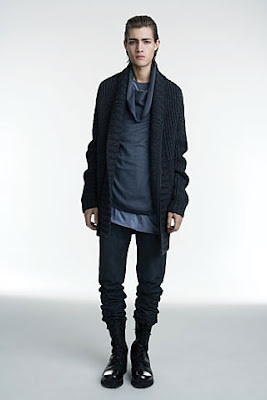 Helmut Lang's work has a simple elegance that is inspiring and a razor sharp edge that is enticing. The two coalesce to create a striking crash collision. I love how the looks are layered, as well as the variance of proprtions and materials. I love fall. My favorite season! I love the hoodie coat! Amazing. my gosh these are fantastic! the clothes are outstanding. i love the boots. Like something for an adventure! helmut lang is all about draping in a way that is chic but wearable. 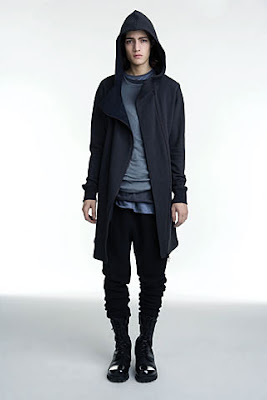 there are definitely things in this collection which exude a sort of rick owens vibe, but are made in such a way that they are reasonable for everyday wear. lovely post. aaah wintery months. i tend to always dress darker during those times. no idea why. it's like i'm mirroring the sky or something. love this collection! hmm i want that beanie! So cool. Love the model. Thanks for the note. Hope you hare having a beautiful weekend. the colour palette is wonderful, the styling and relaxed intentional layering is perfect. would so wear those pants! Love the excerpt that illustrates the photographs, beautifully described. 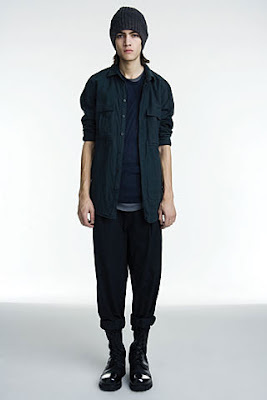 Love too the simplicity of the looks, the effortless deliverance and the idea of molding a trend to make it your own. Hope you had a fab weekend. I love it - so cozy! Have a great Sunday, DK! I completely agree, the simple layering looks so good and that first, somewhat deconstructed grey cardigan is quite lovely. excellent collections but you're right, not for the faint hearted! I love layered and lean on the boys. And the girls, for that matter. 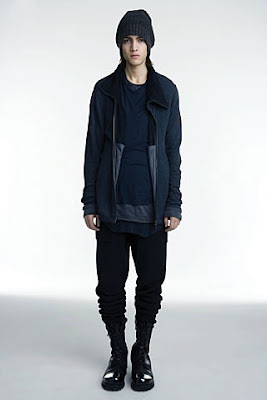 Helmut Lang does this look particularly well. I'm really feeling grey these days, too. Hope you enjoy your weekend! It's Labor Day Weekend in the states. That means no work on Monday! As always a great editorial, very well explained. I agree this collectin is a good example, and I'm much into this new look for Fall, dark... I'm scared about it, me... a colour lady????? What am I going to do???? Love this ! The menswear is beautiful,loving this style ! I don't think there is anything wrong with liking the same gray colors when the season calls for it, but I know what you mean by wanting that extra something added. I can't wait for Fall, either! Aaah I love all of these pieces! I have really been liking darker colors as of late. Your style is so effortlesly casual-chic - you OWN IT!! Your description is so gorgeous! I'm looking forward to times when a darker outfit seems more appropriate. I just can't do them in the summer on general principles. I almost always associate fashion writing with bland trend forecasts and collection reviews. Which is why your blog is so appealing. The way you can conjure images with words, of strong poetic quality. You elevate fashion, give it depth, meaning and a cause. Love your writing. absolutely these outfits will loook good on you! i like the all dark colors but it doesnt fits my style! Long time ago!! Hope everything is alright! 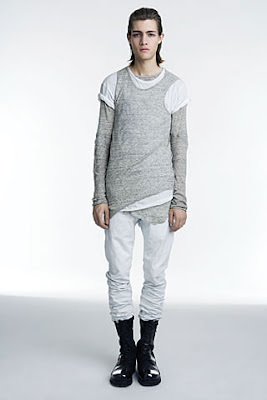 Just love Helmut Lang!!! Throwing the fashion this way pampers to try all this ! thats what i can say AWESOME..
Hehe this look reminds me of 'derelict' from Zoolander, but it is actually rather chic! I think grey is an absolute winner when it comes to clothes - it's so versatile and pretty - yes! I think grey is a pretty colour! Lovely post DK! Great photos. These are all so amazing. I hope you had a wonderful start to your week. Cheers! You. Are. Such. A. Freaking. Great. Writer! Love the fall----and the thrill of brisk days and comfy sweaters---thanks for making me excited! I always love how you turn fashion into lovely inspiration for your great writing. The clothes look so comfortable! I've been loving charcoal greys lately...maybe it's me longing for some rain in this dry dry desert? this is the reason why i'm such a tomboy =) LOVE!